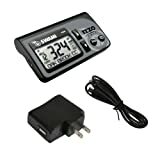 The IZZO Swami Golf GPS Watch is a more affordable alternative to many higher-priced Golf GPS units on the market, but works just as well by offering many of the same features and benefits needed to maximize your performance on the course. The Swami GPS Watch comes preloaded with over 25,000 worldwide course maps and requires no computer downloads or an annual subscription. Just charge and play The unit is easy to read (even in bright sunlight) and operate and offers accurate distance to the front/center/back of the green, auto-hole advance and course map edit functions. Added features include shot distance measurement and a digital course scorecard. The rechargeable battery holds an 8+ hour charge in GPS mode and can last up to 2 full rounds (40 day charge in time-only mode). Watch functions include time/date, alarm and odometer. Durable and waterproof-with a 90-day limited warranty. 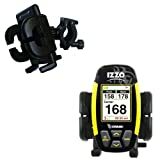 Cyclists far and near are finding that you no longer need to have your Izzo Swami 4000 stored away in your backpack (or saddlebag) when out on a trek. With the Gomadic Handlebar Mounting system, you can always have constant visibility and easy access to your device at all times. With a custom designed mounting base that will easily attach to your bike handlebars (diameter range of 13-28mm) and a holder built to accommodate the dimensions of your Izzo Swami 4000, your device and your handlebars will quickly become one integrated unit. Do not ride a bike? No problem, as this holder also works great on ATVs, golf carts, snow mobile and even baby strollers!